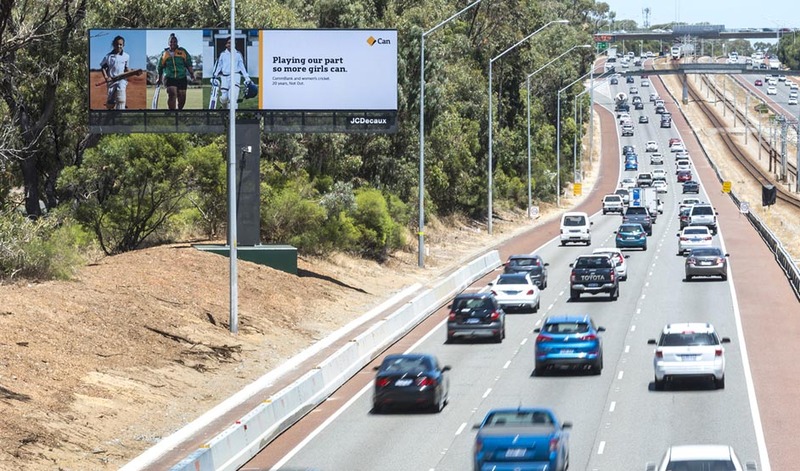 APN Outdoor, now part of JCDecaux, has extended its Out-of-Home footprint launching Perth’s newest digital supersite on the Mitchell Freeway. Strategically positioned for maximum exposure on Perth’s major northbound thoroughfare, the super-sized digital billboard measures 12.66 x 3.35 metres and captures three lanes of inbound traffic heading towards the central business district. JCDecaux’s use of digital supersites on motorways and high traffic corridors linking regional centres and suburban hubs with major cities delivers new and innovative ways for advertisers to connect with their audience. The Mitchell Freeway supersite launch is another key component of JCDecaux’s expansion in the Perth market. In December last year, JCDecaux signed a new agreement with Perth Airport, rounding out its existing contract covering internal advertising in all four terminals, as well as external billboards approaching and within the Perth Airport precinct. JCDecaux currently holds the rights to all external advertising at the Airport, along with internal advertising in T1 International, T1 Domestic, T2 and T3 terminals. In addition, it took on the rights to advertising in T4 – where Qantas Group operates its domestic services – on January 31, marking the first time Perth Airport has worked with one advertising provider across all its terminals. Definitely what the one stretch of Mitchell freeway that doesn’t have regular crashes needs is a massive digital distraction.